Today, we’re excited to announce the next phase of Riskalyze Pro with the launch of professional-grade portfolio construction tools designed from the ground up for investment advisors. We believe in independent advisors as a key part of the solution to make investing better for Main Street, and getting advisors out of the mind reading business will help them grow assets and protect their clients. 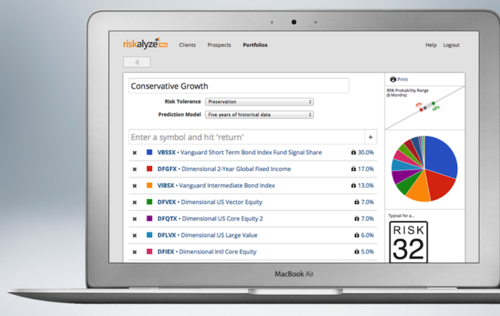 Advisors can use Riskalyze Pro to sift through their favorite funds or stocks, and calculate the optimal allocation for a specific client risk tolerance. The tool performs all of the correlation analysis to maximize diversification in the portfolio, and calculates the 95% probability range that the portfolio will stay inside during a six month period. Alternatively, advisors can “lock” the allocations for some or all of the investments in the portfolio, giving them the analytics they need to show clients the risk inherent in their existing allocations, or in an advisor’s model portfolios. Advisors can build portfolios using any publicly traded stocks, ETFs and mutual funds, and support for unlisted investments like REITS, MLPs and annuities will follow shortly. Riskalyze Pro includes several powerful performance prediction models, and advisors can drill down to dictate performance predictions at the security level as well. Riskalyze Pro empowers independent investment advisors to replace emotion and subjectivity with the quantitative science of the Risk Fingerprint, and to focus on growing their assets and protecting their clients in three key ways. Building superior portfolios that pinpoint client risk expectations. The only thing that beats performance? Predictability. Meeting client expectations gets a lot easier when advisors have the ability to choose portfolios based on a quantitative measurement of client risk tolerance. Avoiding compliance issues with quantitative documentation of client risk tolerance. It’s time for advisors to get out of the mind reading business with these qualitative questionnaires and one-size-fits-all assessments. Our patented Risk Fingerprint technology turns client risk tolerance into quantitative math, and that’s a better world for advisors and investors. Turning their prospects into clients with a personalized pitch. By combining their investment ideas with the prospect’s Risk Fingerprint, advisors can start delivering value and building a relationship with prospective clients well in advance. Today marks the second phase of a staged rollout for Riskalyze Pro, which started with client risk assessment tools and now, portfolio construction. Prospect email campaign tools will arrive out of beta in the coming weeks. Advisors get access to all of these tools for limited-time pricing of just $129/month or $1,419/year. Discounts are available for multiple-advisor firms. Qualified advisors can trial the product with their clients by signing up at pro.riskalyze.com.